If ever there is an award for Most Underappreciated Kitchen Staple, I fully intend to nominate vinegar. And my love of vinegar has only increased over the years, using it in everything from marinades for grilled veggies, salad dressings and cleaning products. As it turns out, I was actually underutilizing this culinary powerhouse myself, simply because I didn’t know just how amazing it can be. Enter herb infused vinegars, which are so simple to make that there really isn’t a reason not to. For years i’ve been using vegan* red wine vinegar, olive oil, with rosemary and garlic as my go-to grilling marinade for eggplant, zucchini and summer squash. This combination has served me well for years, but then I infused my vinegar with the rosemary and garlic for the first time, and I will never go back to not using herb infused vinegars again. The depth of flavor and earthiness you get from the herbs is so much more pronounced once they’ve infused with the vinegar. It’s really a night and day comparison. The flavors are so much richer, fuller and brighter. 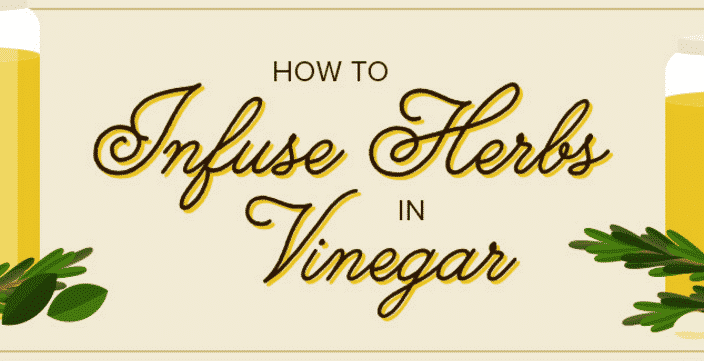 The process of making herb infused vinegar is incredibly simple, and the guide below handles pretty much everything you need to know. Below the guide I’ll list some of my favorite combinations, but I highly encourage everyone to try out their favorite herbs. *Just a note: as many of you likely know, not all vinegar is vegan. Some vinegars, like Balsamic vinegar and malt vinegars, are refined and filtered using whey or isinglass, both of which are made from animals or animal products. It’s always worth digging into the specific brand you like using to make sure it is a vegan vinegar. Preston Hemmerich is a freelance writer. He enjoys writing about food, politics, travel and sad attempts at humor.